ANONYMOUS - Reis-kaart van het Britsche gezantschap van Hang-choe-foe naar Quang-choe-foe of Kanton in China. Title : Reis-kaart van het Britsche gezantschap van Hang-choe-foe naar Quang-choe-foe of Kanton in China.. Size : 16.9 x 12.3 inches. / 42.8 x 31.2 cm. 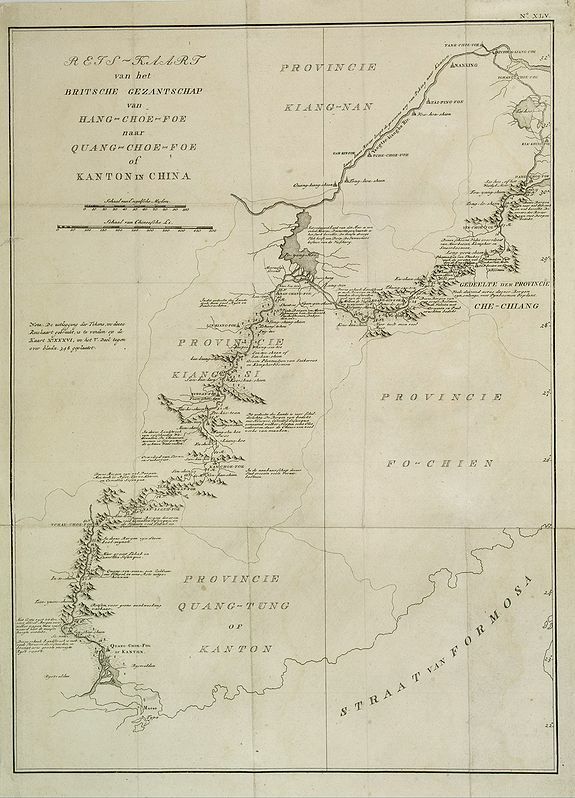 Description :Uncommon map of eastern part of China, showing a journey of the English Embassy from Hangzhou (south of Shanghai) to Guangzhou (Canton). The maps is giving a wealth of information gathered during the mission. Condition : Some foldings as issued. Good condition.